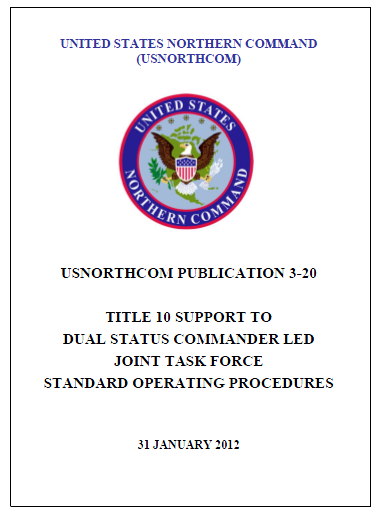 This chapter provides an overview and background of the Dual Status Commander (DSC) program, and it provides an introduction to the Title 10 Support to Dual-Status Commander Led Joint Task Force Standard Operating Procedures which details the roles, responsibilities and processes/procedures for USNORTHCOM Staff, components, subordinates, and assigned/attached forces in supporting the DSC program. 1.1.1. This standard operating procedure (SOP) outlines the Title 10 (T10) staff roles, responsibilities, and processes/procedures for support to a DSC during Defense Support of Civil Authorities (DSCA) operations (events/incidents requiring a Federal response). 1.1.2. This SOP consists of five chapters which provide: an overview of the DSC program (Chapter One); an outline of the roles, responsibilities, and processes/procedures for United States Northern Command (USNORTHCOM) Staff Support to DSC led Joint Task Forces (JTFs) (Chapter Two); T10 Deputy Commander (Chapter Three); the Joint Support Force Staff Element (JSF-SE) SOP (Chapter Four); and a recommended JSF-SE training curriculum (Chapter Five). 1.1.3. This SOP assumes that USNORTHCOM will provide a baseline JSF-SE that will integrate with the State JTF staff to support the T10 requirements. The JSF-SE will leverage support from the State JTF staff to meet the T10 requirements (e.g., reporting of JTF Situation Report (SITREP)/Storyboard, joint personnel status reports (JPERSTATs), logistical status reports (LOGSTATs), etc). While DSC led JTFs can organize with parallel and separate staff structures under a DSC, the best practice referenced within this SOP is the integrated staff model, where T10 staff are fully integrated with the State Active Duty/Title 32 (SAD/T32) staff. 1.1.4. All references to State within this SOP are used to refer to States, Territories, Commonwealths and the District of Columbia. 1.2.1. In January 2009, the Secretary of Defense (SecDef) directed the development of options and protocols that allow Federal military forces supporting the Primary Agency to assist State emergency response personnel in a coordinated response to domestic disasters and emergency operations, while preserving the President’s authority as Commander in Chief. 1.2.2. In February 2010, during the first Council of Governors meeting, the SecDef acknowledged mutually exclusive sovereign responsibilities of Governors and the President, and urged all participants to focus on common ground and build a consensus approach to coordinate disaster response. 1.2.3. In August 2010, the Commander, United States Northern Command (CDRUSNORTHCOM) hosted an orientation visit for the initial State DSC candidates (i.e., Florida, California, and Texas). in support of civil authorities in the United States. 1.2.5. In May 2011, CDRUSNORTHCOM assigned USNORTHCOM/J36 Domestic Operations (NC/J36) as office of primary responsibility (OPR) for DSC. NC/J36 will coordinate with NORADUSNORTHCOM (N-NC) J5 and N-NC/J7 on doctrine and training, respectively. 1.2.6. This SOP is one of many documents which address the DSC integrated response to a DSCA event. 1.2.7. Figure 1-2 provides a hierarchy of DOD’s DSCA-related documents. Links to these references can be found in Annex A. 1.2.7.1. DOD Directive 3025.18 outlines the DOD roles in providing DSCA. 1.2.7.2. DOD Directive 5105.83 National Guard Joint Force Headquarters – State (NG JFHQs-State) establishes policy for and defines the organization and management, responsibilities and functions, relationships, and authorities of the NG JFHQs-State. 1.2.7.3. The Chairman, Joint Chiefs of Staff (CJCS) DSCA Standing Execution Order (EXORD) directs DSCA operations in support of the National Response Framework (NRF) and identified primary agencies in the USNORTHCOM and United States Pacific Command (USPACOM) domestic geographic areas of responsibility (AOR). 1.2.7.4. The CDRUSNORTHCOM Standing EXORD for DSCA operations outlines how USNORTHCOM will employ DOD forces in support of other federal agencies in the USNORTHCOM Operational Area (OA). 1.2.7.5. USNORTHCOM concept plan (CONPLAN) for DSCA is the Geographic Combatant Command (GCC) plan to support the employment of T10 forces providing DSCA in accordance with (IAW) the NRF, applicable federal laws, DOD Directives, and other policy guidance including those hazards defined by the National Planning Scenarios that are not addressed by other Joint Strategic Capabilities Plan tasked plans. 1.2.7.6. USNORTHCOM operations order (OPORD) 01-11/01-12 provides direction on the conduct of military operations within the USNORTHCOM AOR. USNORTHCOM produces an OPORD annually to address planned/forecasted military operations in support of the USNORTHCOM Theater Campaign Plan. 1.2.7.6.1. Subsequent Fragmentary Orders (FRAGOs) provide specific guidance (or changes to previous guidance) on unique events to address unforecasted military support operations. 1.2.7.7. The DSC Concept of Operations (CONOPS) describes the terms, responsibilities, and procedures governing the qualification, certification, appointment, and employment of a DSC for designated planned events, or in response to an emergency or major disaster within the United States, or its territories, possessions, and protectorates. 1.2.7.8. The USNORTHCOM Initial Entry Concept of Execution (CONEX) provides USNORTHCOM doctrine and procedures for establishing Joint initial command and control (C2) and support capability for its Civil Support (CS), Homeland Defense (HD) and Department of State (DOS) support operations. 1.2.7.9. The JTF Commander Training Course (JCTC) Handbook serves as a working reference and training tool for individuals who will command and employ JTFs for HD and CS at the federal and/or state level.